Have you wondered how some cities leave a mark on you – in a good way – for life. Such has been the case with Brussels where we had a layover – we were travelling from Amsterdam to Paris – and that was enough time to fall in love and put it on our ‘must visit again’ list. And Athens. The elder sister, brother in law and I spent just three days in the capital city of Greece but there was so much that we saw in those three days. We wanted to stay back and learn some more about the city, its people and the civilisation that was the bedrock for generations to come. The grandeur and opulence of the Acropolis of Athens and Panathenaic Stadium aside, here are a few places that you must visit when in Athens. Since when are graveyards tourist destinations, I wondered, as we walked towards Kerameikos through the gritty neighbourhood of Gazi. Ranked rather lowly in several ‘must see in Athens’ lists you might stumble across on the internet, the Kerameikos is a lesser explored gem in the vast array of monuments spread across the city. A necropolis (a cemetery, especially a large one belonging to an ancient city), Kerameikos had been the burial ground for Athenians for several centuries– the dates range from 16 to 30 – and is now an archaeological site relatively close to the city centre but away from the ‘touristy’ zone of the city. Nestled near the potters’ settlements of the old Athens, along the River Eridanos, the burial ground is a maze of stone remains and replicas of monuments to the dead –the originals having been moved to the museum in the vicinity or the bigger museums around the city. Why do I call it a maze? Because to understand the layout of the site, you need to understand the locations of the walls of ancient Athens and that matter can be sorted out by a quick visit to the Wikipedia page on Kerameikos or pay close attention to the information boards across the site. The high point of the ancient burial ground would be ‘The Street of Tombs’. This is literally a road lined on two sides with imposing monuments and sculptures perched atop graves. Post excavations, several replicas of the original monuments have been placed along these roads to give the visitor an idea of the impressive site –a stretch of road, several miles long, lined with towering and intricately carved monuments looking down as you walk to Eleusis. What a powerful sight that would be! If you are one who likes to go deeper into history and related rituals, you must check out the museum that holds artefacts recovered during excavations. These range from sculptures that were part of the grave monuments, objects of personal use and tributes buried with the deceased. Or the Temple of Olympian Zeus or Columns of the Olympian Zeus is a marvel for its colossal nature – 15 massive columns and a 16th column lying on the ground, broken but blatant in its opulence due to size, these 16 columns are what remain of a temple made of 104 such columns and dedicated to Olympian Zeus, the head of the Olympion gods. Standing tall under the scorching sun, the remains of what could have been one of the wonders of the ancient Greek civilization, have borne the brunt of time, weather and human invasion since construction began in 6th century BC. As per historians and archaeologists, the temple, one of the biggest during its time, also housed one of the largest statues known to man. Over the years however, the statues and other parts of the temple crumbled to pieces and what remained were 16 columns standing testimony to time. Located south east of the Acropolis of Athens and closer to Syntagma Square, you must take time to visit this hidden gem, spend a few minutes studying the marble structures and imagine what 104 columns together would have looked like. Little wonder then that even today, architects and designers look to the Greek classics for that bit of inspiration. An agora was essentially a gathering place, more like a central square, in cities built during the Greek civilisation. These spaces served as locations for announcement of news pertaining to state affairs and also provided space to merchants/ moneylenders/ artisans that stored their goods, set up shops and built workshops in and around the agora. The Ancient Agora of Athens or The Athenian Agora is one of the best examples of this assembly space perched atop the Market Hill. What draws your eyes at this site are the massive carved pillars placed at the entrance to the Odeon of Agrippa, the large concern hall in the centre of the Agora that is said to have a seating capacity of around 1,000 people. The government has made efforts to ensure that while this space is open to the public and protect the archaeological remains; several pieces unearthed during the excavation have been shifted to the museum that is housed in what was the Stoa of Attalos. 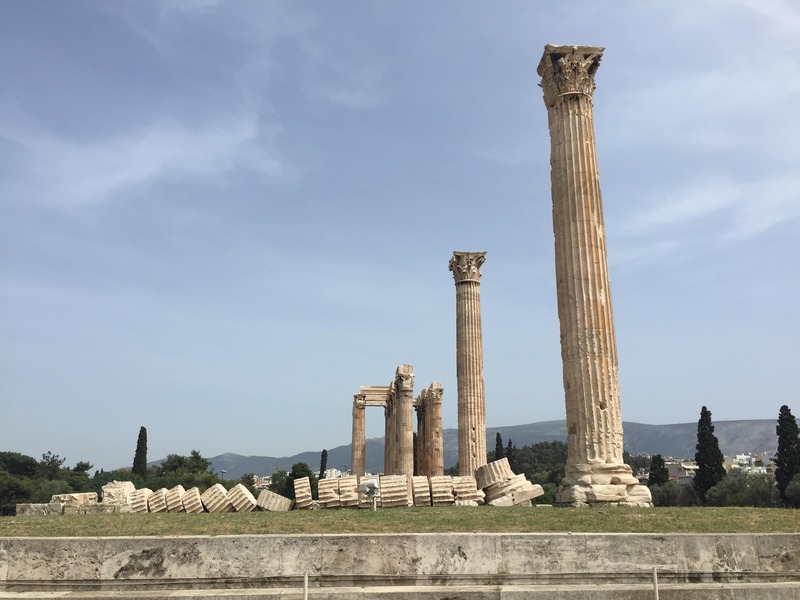 Do be careful when you walk around the Agora – the uneven ground can be tricky for those of us preoccupied with the surroundings and busy imagining the way things may have looked when the ancient Greek civilisation was at its pinnacle. Other things to look out for in this space are the remains of the Athenian Boule, Temple of Hephaestus, sections of the Altar of the Twelve Gods and the museum and the Stoa of Attalos.